If you want to transform your manufacturing company from a commodity parts maker into a full-service provider of highly engineered products, from project inception to final assembly and finishing, consider starting the process by investing in your engineering department. That means that in addition to operating with state-of-the-art manufacturing equipment, fabricators must provide their engineers with the latest-greatest software at the front end, which promises to streamline the engineering and design process. An engineer at AW Mercer takes parts designed in SolidWorks Professional 3D CAD software and loads them into SigmaNest to create efficient sheet nests. Compared to its previous nesting software, AW Mercer reports a 70-percent improvement in nesting efficiency with SigmaNest. That’s precisely the strategy followed at A.W. Mercer, Boyertown, PA, a fabricator once known primarily for providing sheetmetal wrappers to the HVAC industry, In the last few years, the firm has “completely transitioned into a full-service fabricator,” says sales manager Roger Collette. While it has made recent and significant capital investments on the shop floor, a main draw for new customers most certainly are the firm’s recent investments made to enhance its sheetmetal-design services. AW Mercer’s rebirth has impacted the company throughout, including a big move into stainless-steel and aluminum fabrication, having previously been a fabricator of mild steel and galvanealled material. Significant enhancements to its shop capabilities center around its skilled crew of 13 AWS-qualified welders. New capital-equipment additions include 100- and 250-kVA resistance-welding machines, and a laser-assisted LVD Strippit Easy-Form-series press brake with in-process bend-angle monitoring and correction. The equipment joined the existing equipment residing in the 69,000-sq.-ft. production facility including a pair of laser-cutting machines—a 3000-W LVD Strippit and 3500-W Bystronic—and a Beyeler Bystronic 200-ton press brake that features automatic bend-angle compensation. All of this has the firm fit to offer quick turnaround on prototypes, first-article and short-run production, as well as high-volume production, finishing and quality inspection. 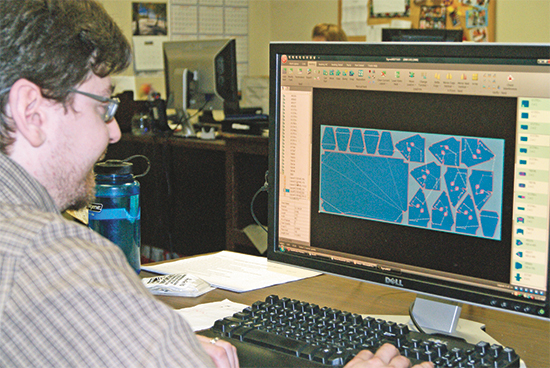 Now a designer and fabricator of complex parts and welded assemblies for a range of applications, including material-handling and conveying equipment and specialized HVAC units for railcars, AW Mercer made, in 2011, another significant software investment to supplement its SolidWorks upgrade. It replaced a 6-yr.-old sheetmetal-nesting package with SigmaNest, from SigmaTek, Systems, Cincinnati, OH. “Our existing nesting software was extremely inefficient,” says Estep, “which really became an issue when we looked to ramp up our engineering-services offerings to customers. 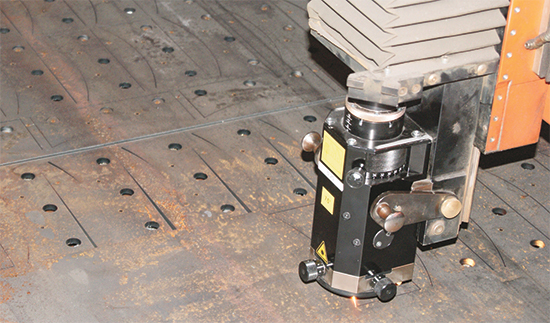 The sheetmetal nests it automatically created for the lasers, as well as for our CNC turret-punching machines and shears, did not efficiently utilize material. This caused our engineers to spend an inordinate amount of time overriding the nests manually to make them more efficient. SigmaTek has even made it easier for SolidWorks users to integrate design with manufacturing, with its latest release—Version 10. In SigmaNest Version 10, SolidWorks PDM Integration allows for the import of SolidWorks files directly into SigmaNest without having to first check out the file from the PDM vault. AW Mercer general manager Tim Meade recalls one specific nesting project that he used to convince corporate management that the firm had quickly recouped its investment in SigmaNest. Where do the firm’s engineers see the difference in nest efficiency from the old software to the new? “In addition to intuitively combining parts more efficiently on the sheets to minimize web size,” Estep says, “SigmaNest better-recognizes part features or openings where other parts can be squeezed in. The other software often failed to recognize openings and cutouts in parts where additional parts could fit. “In the end, since upgrading our nesting efficiency we’ve been able to ramp up our design services,” concludes Collette. “With engineers freed up to offer expertise to new as well as existing customers, we’re better able to provide them with optimum fabrication solutions, in a timely manner. What's up to every single one, it's truly a nice for me to pay a visit this web site, it contains helpful Information.